Until you’ve been sewing for a while all those controls on your sewing machine can feel a bit daunting and you have to constantly double check what they do, never mind what they should be set on. I thought I’d share a little quick reference guide that I use with all the sewing machines for students at MIY Workshop. Although you might not have exactly the same sewing machine as the one in the picture, most are arranged in a similar way and have most if not all of the same controls. Print a copy off and stick it by your machine at home so you’re not, at best, constantly referring back to your manual, or at worst, winging it and hoping for the best! I’ve also put together some quick reference tables you can download with the best settings to choose on your machine for commonly used fabrics. 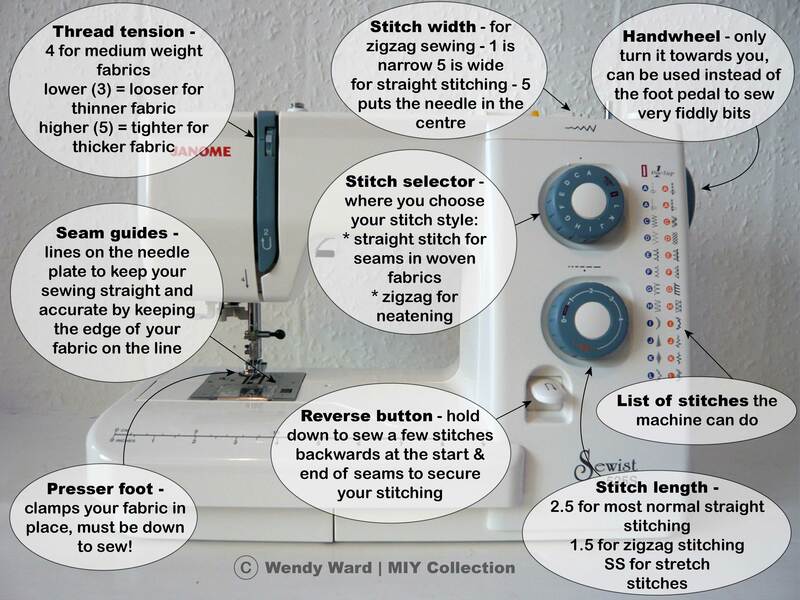 This entry was posted in Sewing Help and tagged controls on sewing machine, how to use a sewing machine, parts of a sewing machine, quick reference machine settings, sewing machine settings, sewing machine tension, Wendy Ward, which settings for which fabrics. Bookmark the permalink.